CHICAGO — If you haven’t already seen Alejandro Cerrudo’s One Thousand Pieces, now is the time to do it. If you’ve already seen Alejandro Cerrudo’s One Thousand Pieces, go see it again. 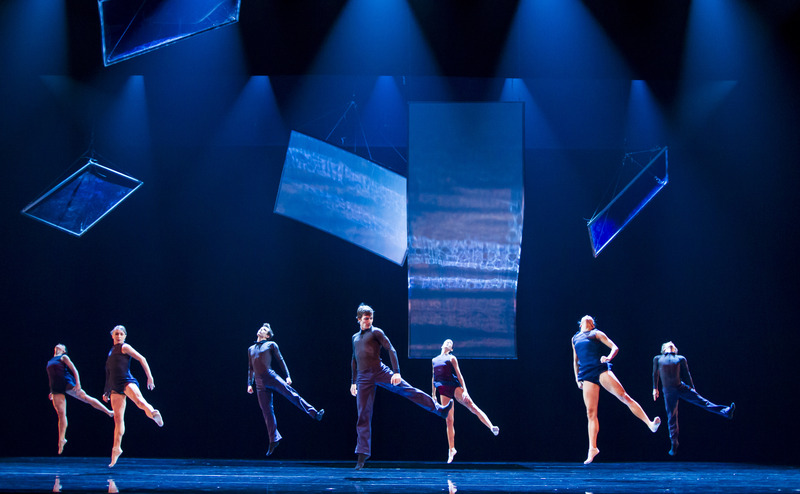 Hubbard Street Dancers in One Thousand Pieces by Resident Choreographer Alejandro Cerrudo. Photo by Todd Rosenberg. Cerrudo’s evening-legnth effort for Hubbard Street Dance Chicago was a first for both parties, and served as the highly-anticipated season opener for the company’s 35th anniversary season in 2012. Chock full of things to see, it’s no surprise the company would revisit this work, even after only a season. Perhaps more aptly placed in the Winter Series (what with all its icy blue tones), One Thousand Pieces is simply one of the most visually stunning works I’ve ever seen. Inspired by Marc Chagall’s America Windows, the blue tones and reflective set of One Thousand Pieces are the only literal references to the world famous stained glass windows living at the Art Institute of Chicago (more famous, perhaps, by way of their appearance on Ferris Bueller’s Day Off). Maybe the flying man in Part II is a nod to Chagall, too. As I said before, there is A LOT to see in this piece, and sometimes all that dancing becomes redundant and unnecessary, which is likely the result of using a musical score of made entirely of Philip Glass’s loops. But scattered among the many, many pretty duets are striking moments of unison enlisting the full company (including the members of Hubbard Street 2). Some of the most beautiful moments are the ones in which the dancers stand still. One could equate these sections to be the Hubbard Street version of the Kingdom of the Shades. Like the Shades, every detail was wanting for exacting precision and, essentially, perfection. While the company didn’t quite achieve this in its opening performance on Thursday night, they came pretty darn close. Hubbard Street Dancers in One Thousand Pieces by Resident Choreographer Alejandro Cerrudo, from left: Ana Lopez, Jacqueline Burnett and Jessica Tong.Photo by Todd Rosenberg. The pearl of One Thousand Pieces is a section embedded in Part II (of III) performed on an elegant slip and slide. Glossy marley is coated in beads of water as three cascades of fog tumble from the battens to frame nine dripping dancers. This section alone is reason enough to see the piece, and a strong reminder that Hubbard Street Dance Chicago is still some of the best concert dance in town, if not ever. Hubbard Street Dance Chicago’s One Thousand Pieces continues through Sunday at the Harris Theater for Music and Dance (205 E. Randolph). Saturday show at 8pm, Sunday at 3pm. Tickets are $25-99, available at hubbardstreetdance.com/winter or by phone at 312-850-9744.